Regular Employment Insurance beneficiaries — N.L. Regular Employment Insurance beneficiaries (year-over-year change) — N.L. Regular Employment Insurance beneficiaries — P.E.I. Regular Employment Insurance beneficiaries (year-over-year change) — P.E.I. Regular Employment Insurance beneficiaries — N.S. Regular Employment Insurance beneficiaries (year-over-year change) — N.S. 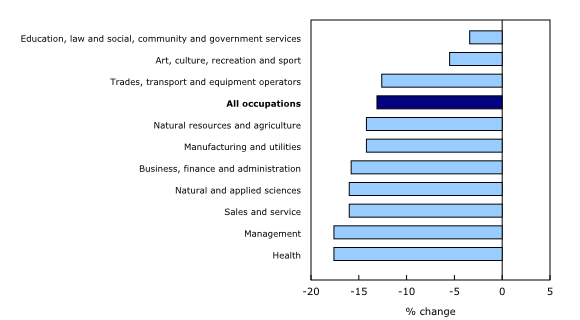 Regular Employment Insurance beneficiaries — N.B. Regular Employment Insurance beneficiaries (year-over-year change) — N.B. Regular Employment Insurance beneficiaries — Que. Regular Employment Insurance beneficiaries (year-over-year change) — Que. Regular Employment Insurance beneficiaries — Ont. Regular Employment Insurance beneficiaries (year-over-year change) — Ont. Regular Employment Insurance beneficiaries — Man. Regular Employment Insurance beneficiaries (year-over-year change) — Man. Regular Employment Insurance beneficiaries — Sask. Regular Employment Insurance beneficiaries (year-over-year change) — Sask. Regular Employment Insurance beneficiaries — Alta. Regular Employment Insurance beneficiaries (year-over-year change) — Alta. Regular Employment Insurance beneficiaries — B.C. Regular Employment Insurance beneficiaries (year-over-year change) — B.C. Regular Employment Insurance beneficiaries — Y.T. Regular Employment Insurance beneficiaries (year-over-year change) — Y.T. Regular Employment Insurance beneficiaries — N.W.T. Regular Employment Insurance beneficiaries (year-over-year change) — N.W.T. Regular Employment Insurance beneficiaries — Nvt. Regular Employment Insurance beneficiaries (year-over-year change) — Nvt. In November, the number of regular Employment Insurance (EI) beneficiaries was virtually unchanged from a month earlier at 439,000, following three consecutive months of declines. Increases in Ontario (+2.6%) and New Brunswick (+2.5%) were offset by decreases in Quebec (-3.8%), Manitoba (-1.5%), Alberta (-1.5%) and Saskatchewan (-1.4%). There was little change in the other four provinces. Compared with November 2017, the number of EI recipients in Canada declined by 66,200 (-13.1%), with all provinces recording year-over-year decreases. In general, variations in the number of beneficiaries can reflect changes in the circumstances of different groups, including those becoming beneficiaries, those going back to work, those exhausting their regular benefits, and those no longer receiving benefits for other reasons. In Ontario, the number of people receiving EI benefits increased 2.6% from October to 115,700 in November. This was the first notable increase since May, as the number of EI beneficiaries in the province had trended down since the start of 2017. Increases in November were observed across most census metropolitan areas (CMAs). The most notable was in Windsor (+21.7%), which coincided with the temporary shutdown of an automobile manufacturing plant. On a year-over-year basis, the number of EI beneficiaries in the province fell by 9.8%. The number of EI beneficiaries in New Brunswick rose 2.5% to 29,800, the fifth increase in six months, following a low point in May 2018. In November, most of the increase occurred in areas outside the CMAs and census agglomerations (CAs) (+2.9%). In the 12 months to November, the number of beneficiaries declined by 8.3%, driven by decreases in the first half of the period. According to data from the Labour Force Survey (LFS), employment has been edging down in New Brunswick since the spring of 2018. In November, the number of EI beneficiaries in Quebec decreased 3.8% to 107,700. This was the fourth consecutive monthly decline in the province. Compared with 12 months earlier, the number of beneficiaries fell by 11.4%. 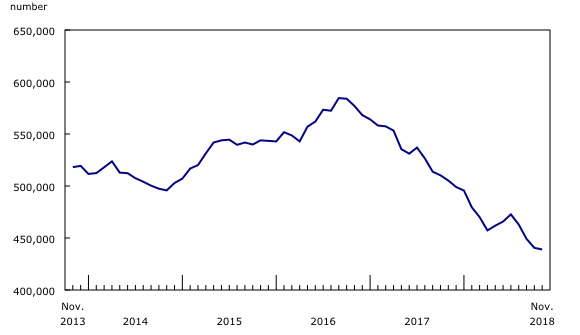 LFS data show that unemployment has been relatively stable in Quebec since the start of 2018. In Manitoba, the number of EI beneficiaries was down 1.5% to 15,200, led by the CMA of Winnipeg (-1.7%). In the 12 months to November, the number of beneficiaries declined by 4.4% in Manitoba. There were 46,200 Albertans receiving regular EI benefits in November, 1.5% fewer than in October. The decrease was due to a decline in the CMA of Calgary (-4.7%), where the number of beneficiaries has trended down since the fall of 2016. At the same time, there were more beneficiaries in the CA of Wood Buffalo (+6.9%). On a year-over-year basis, the number of beneficiaries declined by 27.2% in Alberta, with the decrease spread across the province. In Saskatchewan, the number of beneficiaries has trended down since the beginning of 2018. In November, there was a 1.4% decline to 14,800, driven by decreases in areas outside the CMAs and CAs (-2.6%). On a year-over-year basis, the number of beneficiaries was down by 17.9%, with the CMAs of Saskatoon (-25.6%) and Regina (-21.1%) posting the largest declines. According to the LFS, the unemployment rate in the province fell by 0.7 percentage points over the same period. In November, the number of EI beneficiaries rose among those whose last job was in manufacturing and utilities occupations (+2.7%); followed by sales and service (+2.2%); and art, culture, recreation and sport (+1.2%). At the same time, there were fewer beneficiaries among those whose last job was in 4 of the 10 broad occupational groups, led by education, law and social, community and government services (-2.0%) and natural resources, agriculture and related production occupations (-2.0%). Compared with 12 months earlier, there was a decrease in the number of beneficiaries who were last employed in each of the 10 broad occupational groups. The number of EI claims rose by 8,900 or 3.9% to 237,000 in November, offsetting a decrease in the previous month. The number of claims provides an indication of the number of people who could become beneficiaries. Claims increased in every province except Newfoundland and Labrador, where there was little change. Compared with November 2017, claims increased by 3.4% at the national level. 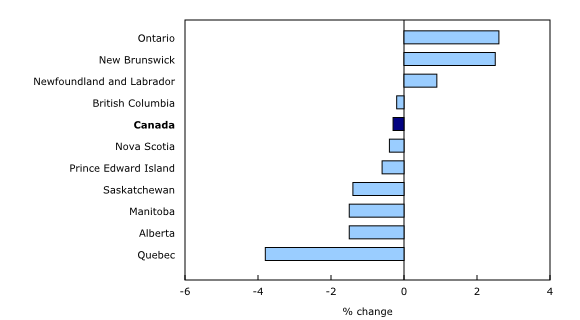 Saskatchewan (-5.2%) and Alberta (-4.4%) were the only provinces in which claims decreased over that period. The number of claims in Canada has been relatively stable since the fall of 2016. In the 12 months to November, the number of EI beneficiaries aged 55 and older decreased by 11.4% compared with a decline of 13.7% for those aged 15 to 54. Declines were similar for older men (-11.8%) and women (-10.8%). The number of beneficiaries in this age group has trended downward since the spring of 2017. According to the LFS, the unemployment rate for this age group trended down throughout 2017, ranging from 4.9% to 5.5% in 2018. The employment rate for older workers has remained relatively high since hitting a peak of 36.4% in December 2017. EI beneficiaries aged 55 and older represented 26.7% of all beneficiaries in November 2018. 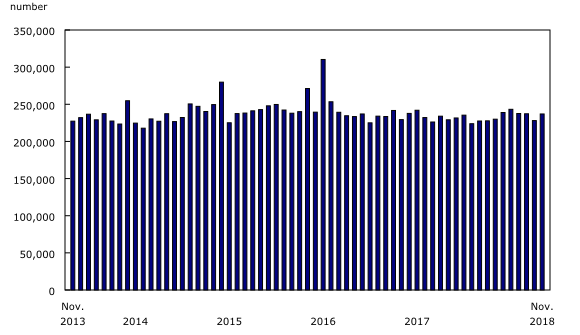 This proportion has been relatively stable since the spring of 2018 after having been on an upward trend that began in the summer of 2015. Those aged 55 and older represented 21.6% of the labour force in November. Since the start of the century, both the proportion of older beneficiaries and of older individuals in the labour force have been trending upward. The proportion of older beneficiaries increased at a faster pace than the proportion of older labour force participants. The analysis presented here focuses on people who received regular Employment Insurance (EI) benefits related to job loss. Claims data pertain to initial and renewal claims received for any type of EI benefits, including special benefits. EI statistics are produced from administrative data sources provided by Service Canada and Employment and Social Development Canada. These statistics may, from time to time, be affected by changes to the Employment Insurance Act or administrative procedures. Regular EI benefits are paid to eligible individuals who lose their jobs and who are available for and able to work, but cannot find a job. To receive EI benefits, individuals must first submit a claim. EI statistics indicate the number of people who received EI benefits, and should not be confused with Labour Force Survey (LFS) data, which provide estimates of the total number of unemployed people. There is always a certain proportion of unemployed people who do not qualify for benefits. Some unemployed people have not contributed to the program because they have not worked in the past 12 months or their employment was not insured. Other unemployed people have contributed to the program but do not meet the eligibility criteria, such as workers who left their job voluntarily or those who did not accumulate enough hours of work to receive benefits. All data in this release are seasonally adjusted. For more information on seasonal adjustment, see Seasonally adjusted data – Frequently asked questions. Numbers in the Daily text are rounded to the nearest hundred. The number of regular EI beneficiaries and the number of claims received for the current and previous month are subject to revision. The number of beneficiaries is a measure of all people who received EI benefits from November 4 to 10, 2018. This period coincides with the reference week of the LFS. However, claims data are for the entire month. On December 18, 2018, the data from January 2004 to December 2017 were corrected for the "Compassionate care benefits," "Special benefits" and "All types of income benefits" series. A census metropolitan area (CMA) or a census agglomeration (CA) is formed by one or more adjacent municipalities centered on a population centre. A CMA must have a total population of at least 100,000. A CA must have a population of at least 10,000. See Standard Geographical Classification 2011 – definitions for more information. Data on Employment Insurance for December 2018 will be released on February 21, 2019. More information about the concepts and use of Employment Insurance statistics is available online in the Guide to Employment Insurance Statistics (Catalogue number73-506-G). To enquire about the concepts, methods or data quality of this release, contact Bertrand Ouellet-Léveillé (613-864-6641; bertrand.ouellet-leveille@canada.ca) or Client Services (toll free: 1-866-873-8788; statcan.labour-travail.statcan@canada.ca), Labour Statistics Division.